The suction and return lines are routed into the Engine Room and connected to one of the compressors. The upper unit (shown) is a 32,000 BTU moudulating system that feeds the State Rooms. The unit under it is a 24,000 BTU unit that is a split system. It is split into the port side of the Salon and the starboard side. The difference is that with the split system, one side is slave to the other. 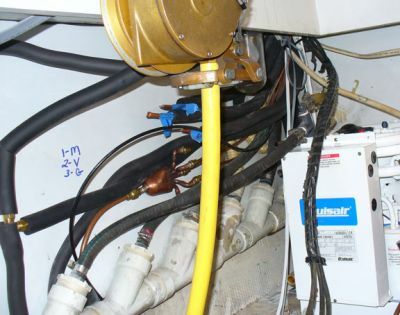 In this case, the port side of the Salon is the master with the thermostat connected to it and the starboard side is the slave.